Steep upward and downward stock market moves are very similar to trends of thirty to forty years ago. As global stock markets lurch back and forth on hopes that stricken European nations will receive adequate bailout funds to keep them going, investors and traders are seeking an historical precedent. Wall Street between 1968 and 1982 is one such example as it was a time of great economic and political instability. During that period there were eight bull and bear markets. In the past twelve years since the beginning of the new Millennium, investors have experienced very similar gyrations. Major bull and bear markets from the late nineteen sixties to the early eighties involved market surges of some 60 to 70 percent and bear market slumps that were as fearsome as 33 percent to 48 percent. From 1982 to 2000, investors who held on to their shares did unusually well. The S&P 500 index soared by 1369 percent during those eighteen years, boosting the reputation of Warren Buffett and other bulls. The only significant setback was the crash of 1987, when the market slumped by 33 percent within a few days, The Tech and Internet boom fuelled the final takeoff from 1998 to 2000 which ended in a final splurge of 53 percent that carried the S&P 500 index to 1528 points. 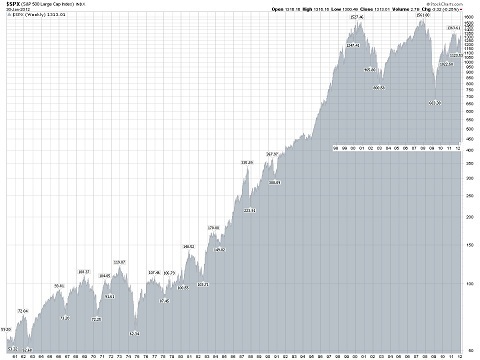 Then followed an horrendous bear market and the S&P 500 index slumped by 48 percent to 801 points in 2003. With minimal setbacks, shares almost doubled and by October 2007, the S&P 500 index reached an all time peak of 1562 points before collapsing by 56 percent to to 683 points early 2009. In the subsequent rally, the S&P 500 index rallied by 76 percent and there have been intermittent downs and ups since then. Indeed between 1998 and February 2012 there have been nine bull and bear runs of varied extremes. History never repeats itself in exactly the same way, but there are several similarities between the seventies and now. America was trapped in the quagmire of the Vietnam War in the late sixties when the stock market peaked in 1969 and then crashed. During the bear market bottom of 1970 some economic pessimists feared a repeat of the 1930’s deflationary depression, similarly to Ben Bernanke, chairman of the Federal Reserve Board and several other pessimistic economists. Arthur Burns, then chairman of the Federal Reserve Board decided to boost the money supply and lower interest rates and in 1971 President Richard Nixon began the process of dollar devaluation by bringing in the era of floating exchange rates. Instead of deflation, the US and world experienced accelerating inflation which reached 10 percent in major industrialised nations. Money poured into share, gold, commodity and property prices. Unemployment fell during those heady times but that trend did not last for long. The 1973 Yom Kippur War between Israel and its Arab adversaries brought in its wake new found power of the Oil Petroleum Exporting Countries (OPEC) which raised the price of oil from $2.70 a barrel to $13 in 1974. That move caused a crash on global stock markets and the S&P 500 plunged by 48 percent. Real estate and commodity markets and gold tumbled, while the US dollar rose. Once again the easy money and dollar devaluation drug was applied and the stock market recovered. Inflation accelerated and unemployment continued to grow. Nixon left the scene in disgrace and in 1976 Jimmy Carter replaced Arthur Burns with an even worse Fed Governor, notably Bill Miller, a businessman who was a former chairman of Textron. Mr Miller opened the monetary spigots. It was not too long before inflation was running at 14 percent, the greenback was heading south, gold was soaring, but unemployment remained high. The fall of the Shah of Iran caused oil prices to soar to $40 a barrel before President Carter appointed Paul Volcker as Fed Governor. He had to apply the nasty medicine of tight money and punitive interest rates causing interest rates and the dollar to soar. Mr Volcker’s policies and tighter control of the government budget lead to an awful recession in the early eighties. Between the seventies and early eighties the combination of high inflation low real growth, intermittent recessions and unemployment became what is now known as a period of stagflation and the “misery index” of high inflation and growing queues of the jobless. Wild fluctuations in the stock market in the past few years illustrate that politicians and the US Federal Reserve Board, European Central Bank and Bank of England are repeating the same mistakes as their predecessors some thirty to forty years ago. They are causing monetary instability by pursuing so called quantitative easing policies, keeping short term rates at almost zero and purchasing sovereign bonds, causing long term rates to decline to less than 2 percent. The monetary drug has lost its strength as unemployment in Organisation For Economic Cooperation and Development (OECD) nations is around 45 million or 8.3 percent of the working force. Inflation, averaging around 3 percent does not appear to be serious yet, but compares with under 2 percent in 2010. Real inflation adjusted returns of bonds are negative. Following the recent 21 percent rally from 2011 autumn lows, participants are concerned about the timing of the next bear market.